The climate of Hoang Lien National Park is unique to Vietnam. It is highly seasonal, with a subtropical climate in the summer and a temperate climate during the winter. Mean annual temperature for Sa Pa town is 15.4°C, with a maximum of 29.4°C and a minimum of 1°C. The warmest months are July and August, and the coldest months are December and January. Snow falls in some years on the highest peaks. The heaviest rainfall occurs in July and August. The weather is also notorious for changing frequently and quickly. 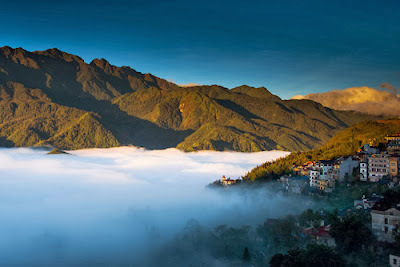 It is said that only in Sapa, one can experience many different seasons within only one day. Coldest month, cloudy, foggy but not too wet. better from early days and gets worse to the later half of the month. Very cold in early days, cloudy, foggy. Getting warmer & better towards later days. Starting rainy season with quick shower occasionally, clear sky with more sunshine but little bit warm in the open at noon. Autumn starts, getting drier and normally very nice towards the end of the month. Wet winter starts and get worse at the later days of the month. 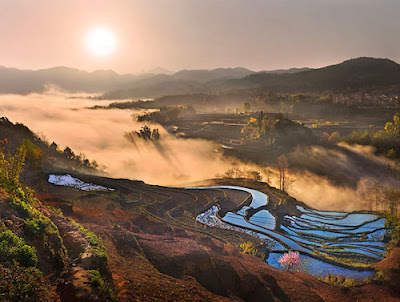 And if you want to go there in winter, you can get some great feelings with the weather and sightseeing at there, Winters can be decidedly chilly, especially in the Northeast where night frosts are not uncommon from December to February, but the compensation is daybreak mists and breathtaking sunrise views high above valleys filled with early-morning lakes of cloud. During the winter months, the temperature is much cooler and it is advised to bring a some warmer clothing (good waterproof jacket, sweater, wool socks).